Designated as Singapore’s first heritage town in 2011, the Joo Chiat/Katong area is home to Singapore’s largest remaining cluster of Peranakan shophouses, which are unique for its combination of Chinese, European and Malay architectural influences. It is in this charming, quaint neighbourhood where you can truly experience the vibrancy of Peranakan culture firsthand. 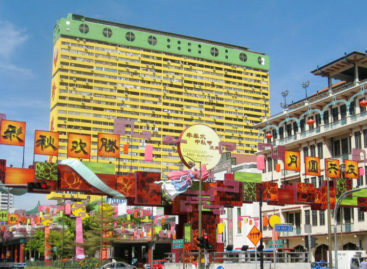 In the 1920s, this residential suburb was a popular seaside resort for the wealthy English-educated Peranakan middle class, who gave the neighbourhood a unique and colourful identity. The term “Peranakan” is derived from the Malay word “anak”, meaning “child” and refers to people of mixed origins. Many of the Chinese, Indian, Arab and European traders who came to the Malay archipelago in the 15th to 17 centuries married local Malay women and raised “Peranakan” children who observed a mix of their parents’ eating, dressing, artistic and religious customs. Today, Peranakans make up less than 1% of the Singaporean population but their distinctive culture continues to play an influential role on local architecture, food and pop culture. Famous Peranakans include Singapore’s first Prime Minister, Mr. Lee Kuan Yew and Tan Tock Seng, who opened the first hospital for poor Chinese. You can learn more about the history of Peranakans at the Peranakan Museum, but first a tour around Joo Chiat/Katong is necessary! 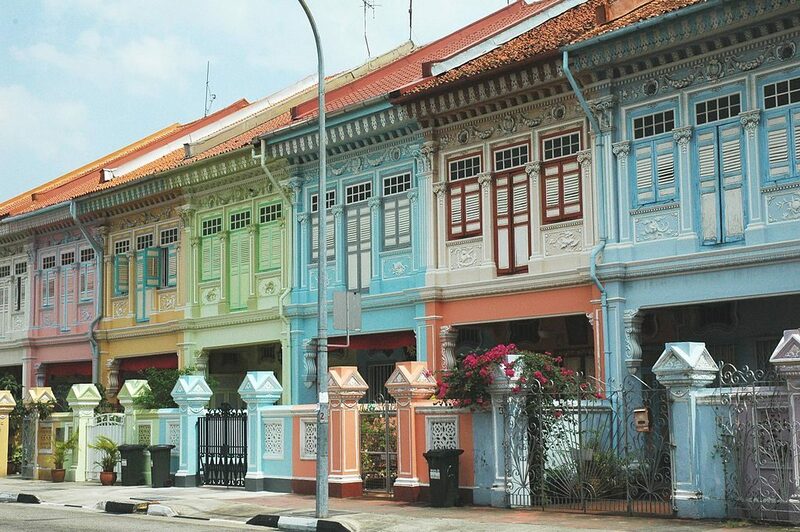 Koon Seng Road – This neighborhood’s most iconic road is famous for its distinctive Peranakan pre-war architecture. Every shophouse boasts ornate ceramic tiles, floral motifs, and pastel-colored exteriors. The majority of these duplex terrace houses were built in the 1920’s, and some have even won awards for their well-designed spaces. 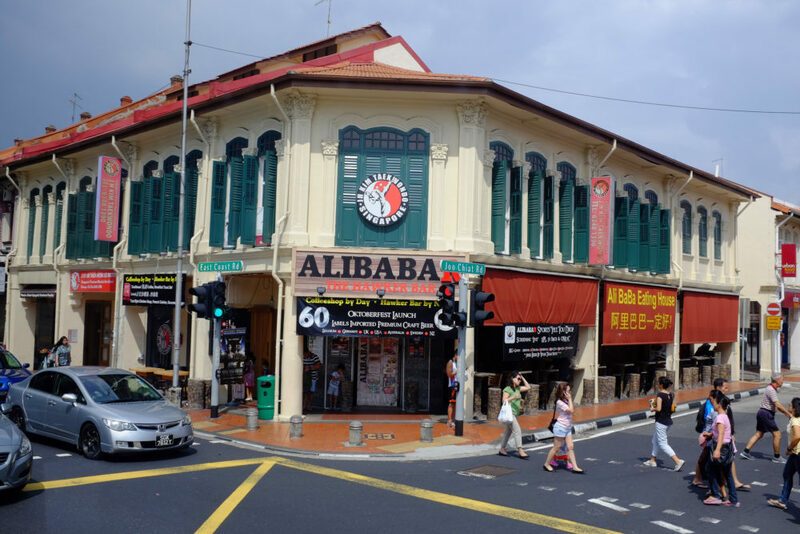 This area is a popular photoshoot space for weddings and blogshop owners, but we love Koon Seng Road because it gives us a chance to get away from the bustle of the city and enjoy life in an authentic “old Singapore” town. Katong Antique House – Step into a restored two-storey Peranakan shophouse/family home and meet owner and curator Peter Wee to learn more about Baba history and culture. 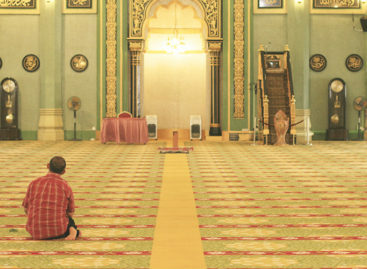 A fourth-generation Baba and the president of Singapore’s Peranakan Association, Peter has always been interested in his ancestry and decided to share his knowledge of the society by creating a museum out of this house he inherited from his grandfather in the 1970s. The top floor houses a gallery that reminded us of the creative energy we felt in Holland Village. This massive 25,000 sq meter mall is your go-to shopping hub for all things Malay – from textiles and carpets to crafts, jewelry, and food. To get a souvenir in line with the culture of this heritage town, we recommend visiting the shops selling traditional Peranakan and Malay costumes. 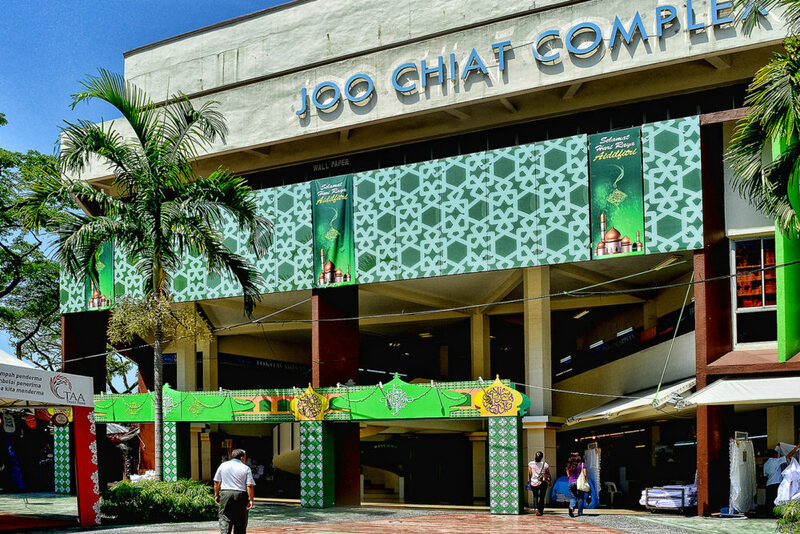 There are also numerous tailor services here to custom design your outfits, which is why Joo Chiat Complex is especially popular with Muslims during the Hari Raya festival. They say women are obsessed with shoes. Well, at Rumah Bebe, women will be in for a treat for their feet as shop owner Bebe Seet painstakingly sews Peranakan-style slippers and shoes bead by bead. Rumah Bebe also sells an array of other Peranakan-themed merchandise, including porcelain, silver-ware and jewelry, which are distinctive for their brightly colored floral and animal patterns. Located in a Peranakan house dating back to 1928, the shop itself is also a historical gem, and you will feel as if you’ve walked into the past. We believe in supporting local and less-known Asian artists, so head to this shop to pick up a contemporary Asian oil or acrylic piece to decorate your home – affordable pieces start from below $600. You can also send in your own photograph and have their in-house artists convert it into a painting. Laksa, a Malay-Chinese curry noodle known for its rich coconut broth, is already a well-known delicacy in Singapore. But Katong laksa is a must-try dish in this neighborhood as it was inspired by Peranakans living in Katong. The noodles here are cut short so you only need to eat it with a spoon, allowing you to slurp up the soup at the same time. There are many places claiming to be the “original” Katong laksa, including 328, but we recommend this place because they are so good they even beat Gordon Ramsay in the 2013 Singtel Hawker Heroes Challenge. Exactly as the name of this coffee shop says, this eatery specializes in crispy roti prata. 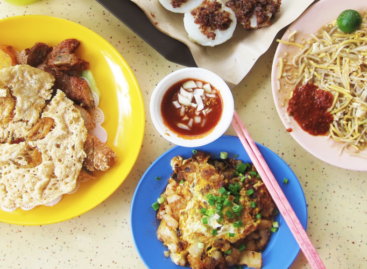 A genuine Mom & Pop shop like this is hard to come by these days, and we love that Mr Mohgan flips his own pratas while his wife, Mrs Mohgan, serves these pratas in stacks to breakfast crowds. The dough is entirely homemade, as are the three types of dipping curry – Dhal, Mutton and Fish. When in Rome, eat as the Romans do. Likewise, in Singapore’s heritage Peranakan town, enjoy an authentic Peranakan meal at Chilli Padi, where its simple decor, round Chinese tables and wooden chairs will make you feel like you’re dining in someone’s home. Served in traditional Peranakan ware, must-try’s at Chilli Padi include the curry fish head and cabbage rolls. We love a good ice cream spot on a hot day in Singapore, and LICK is just the place in the Joo Chiat/Katong neighborhood. With 25 to 40 flavors to choose from daily, every ice cream is hand-churned in-store every morning. We recommend going for their Singaporean-inspired flavors, including Milo Dinosaur and Kaya Toast, and topping them with Koko Krunch and Honey Stars cereal. Chin Mee Chin is an old-time coffee shop that evokes the nostalgia of old Singaporean days with its tiled walls and traditional mosaic floors. A definite must-try here is their kaya buns. arguably one of the best in Singapore. The kaya is spread over buns, rather than sliced toast, and the jam is entirely homemade to preserve a more eggy taste. A selection of other traditional Asian pastries are offered, including egg tarts and spam rolls. You will literally feel at home here because this chic cafe was opened by a group of interior designers who invite you to try out their different furniture while enjoying their barista coffee. If you’re sitting on a couch that you find particularly comfortable, for example, you can ask their in-house consultant on pricing and availability details. Make sure to grab their specialty hot dogs as well, inspired by the flavors of different countries (Korea, Mexico, Singapore and Germany). 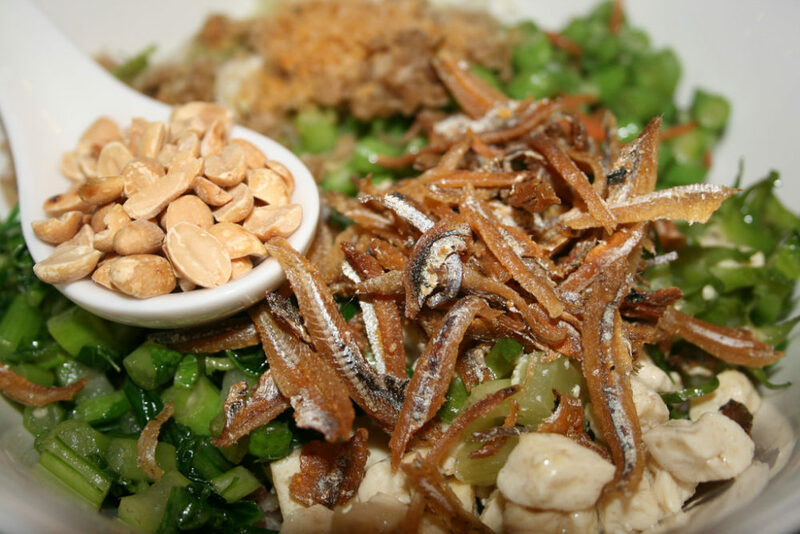 This restaurant’s speciality is Thunder Tea Rice, a Hakka dish that is all the rage today because it is somewhat an Asian detox meal requiring you to pour a bowl of tea over a mixture of vegetables, tofu and herbs. Thunder Tea Rice is said to have originated during China’s Qin Dynasty (221-207 AD) and is supposedly also effective in treating any joint and stomach pains. This shop is known island-wide as having the best traditional Peranakan bak chang, pyramid-shaped glutinous rice dumplings wrapped in bamboo leaves and stuffed with various savoury fillings, including shrimp and pork. Buy these for a good take-home snacks, along with their wide selection of Nyonya kueh, which are bite-sized steamed desserts and cakes made of glutinous rice found commonly in Southeast Asia. Try the colorful nine-layer kueh lapis, which are steamed again and again with each color painstakingly added layer by layer to create a rainbow look. Kopitiam (local coffee shop) by day, and “hawker bar” by night, we like Alibabar for its chill out fusion Singaporean-Western vibes. You will be spoilt for choice with their impressive range of 70+ drink labels and international craft beers, to be paired with food from the shop’s 5 stalls selling kopitiam classics, such as prawn noodles and hokkien mee, as well as gourmet burgers and Japanese cuisine. Come to this bikers’ and sports bar for its unique blend of old and new atmosphere. Set in a former Peranakan house, Hogs is popular for its live sports screenings, pool games and huge selection of craft beers, ciders, spirits and wines. Alvin Yapp has decked out his post-war Joo Chiat house with an extensive collection of Peranakan antiques and furniture, and he warmly invites the public as guests to his home to learn more about Peranakan heritage. The beautiful architecture was similar to those we discovered in Kampong Glam, full of ethnic patterns. Yapp is so passionate about sharing Peranakan culture that you can pre-book his private dinners, which are based on his mother’s Nyonya recipes. Built in 1921, this beautiful Buddhist temple is dedicated to Kuan Yin, the Goddess of Mercy. Both devotees and visitors are welcome to join their various celebrations and events throughout the year – highlights include Chinese New Year’s Eve and the Mid-Autumn Festival. One of the oldest Hindu temples in Singapore dating back all the way to the 1850’s, SSVT is also the only temple in Singapore with a kamala paatham, a specially sculptured granite footstone at the entrance found in certain Ancient Chola temples. This historic gem was damaged by a bomb in World War II and refurbished multiple times afterwards. 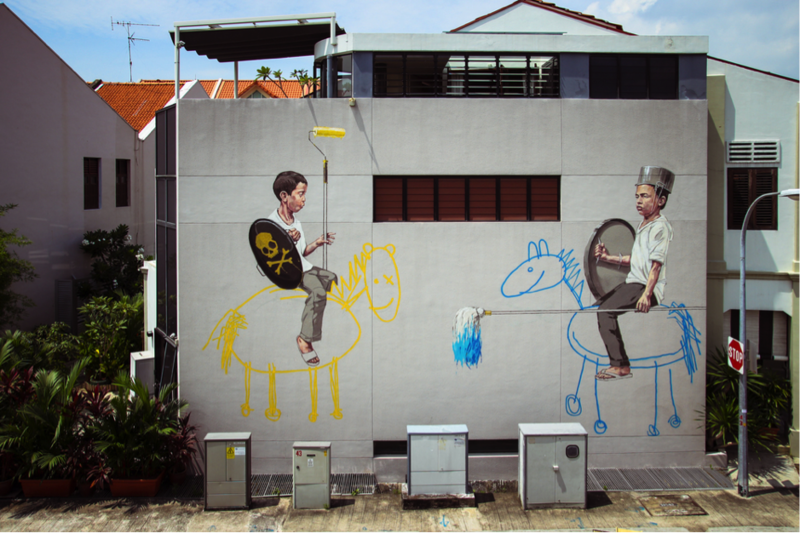 Spot this cheeky wall mural by the Joo Chiat Terrace Interim Park of two boys play-fighting on imaginary war horses. The genius behind this is Ernest Zacharevic, a contemporary artist most famous for his Banksy-like street art in Georgetown, Penang. Under the famous Peranakan Kim Choo brand, this boutique/gallery is run and owned by internationally recognized fashion designer Raymond Wong, who specializes in creating and embroidering kebayas and sarongs. Not only can you consult him for a customized dress fitting, but you can also book Peranakan beading classes with him.